Bloating is an uncomfortable sensation characterized by a tight or full feeling in the abdomen, which is normally caused by water retention or excess intestinal gas that cannot escape. It is normally a short-term problem that goes away on its own relatively quickly, but if it occurs too often, it can nonetheless lead people to seek solutions. 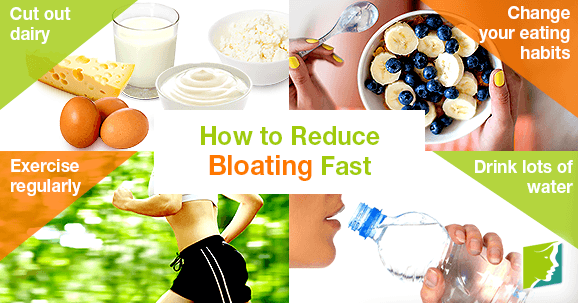 Read on for tips on how to easily reduce bloating fast. Dietary habits are one of the leading causes of bloating and changing what you eat can make a huge difference in how often bloating occurs. There are certain foods that are known to be general triggers for bloating, but some people might have their own triggers, too. Try to work out what these are and you can modify your diet to avoid them. Another trick to try and reduce bloating fast is to see what happens when you cut out or reduce consumption of dairy, as many people are unaware they are lactose intolerant, which can lead to bloating. As well as changing what you eat, a good way to reduce bloating fast is to make changes to how you eat; eating too fast means it is more likely you will swallow air, which will get trapped in the body. Furthermore, the digestive enzymes in the saliva do not have a chance to get the digestive process started, so food sits in the stomach for longer. When this happens, gases can be released from the stagnating food and cannot always escape. In addition, it is advisable to eat smaller portions more frequently than have three big meals a day. Exercise helps reduce bloating fast in two ways: it releases blocked gas so that it can pass through the body, and it also stimulates more blood flow to the digestive tract, helping it function more efficiently. It is not usually recommended to exercise directly after a meal, but exercising after at least half an hour has passed can be very beneficial. Although it seems counterintuitive, drinking lots of water will reduce water retention in the body. This is because a body that is dehydrated will try to hold on to the water it does have in preparation for the future. By assuring your body that water is not in short supply, the liquid will be able to pass through unhindered and do its job, such as flushing out the kidneys. Bloating is not harmful, but it is uncomfortable, so it is understandable that so many people want to get rid of it. To reduce bloating fast, it is normally a simple case of making a few healthy lifestyle choices, such as the ones above, and you will feel much better in the long run. There are things you can do to relieve a bloated stomach. Here is a list of the top 5 hot drinks that help the belly shrink back to its normal size. While bloating can be a problematic symptom of menopause, there are solutions. Click the following link to learn more.